If you look at the topography of Salzburg and its surroundings, you will see that it is in the heart of a wide valley, running out of the mountains. Two massive sets of mountains to the South of Salzburg create a natural barrier, only open where the Salzach river winds its way northwards: this gap is called "Pass Lueg" and was a strategic stronghold of Salzburg for many centuries. To fortify the Pass Lueg, Prince Archbishop Gebhard built a castle ("Burg") in Werfen in the 1077. Today, Werfen is only some 20 minutes South of Salzburg if you are going by car. Back then, it was a far-away outpost of the city. During the "Investitur", a struggle for power between the Pope and the German Emperor, the non-secular state Salzburg got between the lines. 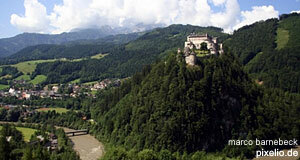 To secure Salzburg, three major castles were extended: The Hohensalzburg Fortress, Hohenwerfen and the Petersberg ob Friesach. In the case of Hohenwerfen, the castle was extended in the 12th century and so a lesser extent again in the 16th century during the "Bauernkriege", when looting and rioting farmers and miners from the South of Salzburg moved towards the city in 1525 and 1526. Shocked by protestant resistance against the powerful Prince Archbishop, the farmers faced Hohenwerfen on their way to Salzburg. Without any chance, the castle was sacked and burnt to the grounds by the rioting hordes. After the unsuccessful siege of the Hohensalzburg Fortress, the farmers were forced to surrender and Prince Archbishop Matthäus Lang ordered to re-built the Hohenwerfen Castle. To punish the local farmers for their support of the riots, they were forced to work on the re-construction. Importing state-of-the-art know-how from Italy in building fortifications and bastions that should stand firearms and cannons, Prince Archbishop Johann Kuen-Belasy ordered a massive re-modelling of Hohenwerfen in 1563. Prince Archbishop Johann Jakob ordered the construction of a large, central keep for the castle in 1573. More adaptations followed during the 30-years-war between 1608 and 1638. This included the erection of a gunpowder tower during the reign of Prince Archbishop Paris Lodron in 1623. After Bavaria conquered Salzburg in an alley with the Napoleonic France, all cannons had to be delivered to the French troops. After the wars were over, Salzburg was secularised and Europe about to start settling again, the question arose what to do with the now useless - since old-fashioned - Hohenwerfen Fortress. The officials argued about one suggestion to destruct the building or another to use it as a prison. Emperor Franz I. of Austria prevented Hohenwerfen from being destroyed, but the Bavarians, who temporarily held Salzburg as part of their territory, neglected the building and left it to decay. The first renovation was done under Austrian rule between 1824 and 1833. Archduke Eugen purchased the castle in 1896. In 1931, large parts of Hohenwerfen were destroyed or seriously damaged in a great fire. It was re-constructed within a year and in 1938, Hohenwerfen became a property of Salzburg province, or the "Gau Salzburg", as it was called during the Nazi-reign. The chapel of Hohenwerfen is among the oldest parts of the building and includes remains in Romanesque style. Originally, the chapel was standing on its own, but in 1565 the "Kapellenbastei" was added as an antechapel. The altar was built by Konrad Schwarz in 1650. In the centre of the altar, you will find the statue "Mary with child" from around 1480. The altar is framed by statues of a bishop, St. Catherine and St. Sigismund. The side altars were made between 1550 and 1560. The right one contains a painting of St. Benno, the left one of Jesus Christ. Beyond its function as a strategic military building, Hohenwerfen has served as a court and prison over centuries. Prominent prisoners were Prince Archbishop Adalbert III., who stayed in the dungeon for 14 days. The governor of Styria was kept prisoner in Hohenwerfen during the Bauernkrieg wars in 1526. Finally, the most famous prisoner of Hohenwerfen was Prince Archbishop Wolf Dietrich von Raitenau, who was held here in 1611 before he was transferred to Hohensalzburg Fortress. Until a few decades ago, Hohenwerfen was headquarter for the regional police academy. Changing exhibitions in the castle tell anecdotes from that time. Today, Hohenwerfen is mostly known for its hunting displays of bird of prey. Hunting with birds was a noble passion for centuries since the early Middle Ages. Today, this tradition is preserved in places like Hohenwerfen. The display shows with freely flying birds like eagles, falcons and hawks are held daily between May and October. Another major attraction nearby are the Werfen Ice Caves (Eisriesenwelt).